All Activities share common properties including assignees, subjects and descriptions. In addition, Activities can be related to Entities and Documents (e.g. Customer or Sales Order). Therefore, you will be able to manage activities related to a specific customer directly from its Details Page. Events may be seminars, company transactions, meetings, deliveries, or anything else of importance that need to be schedules. 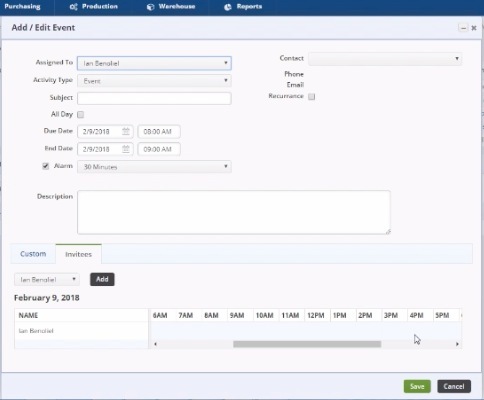 The system will remind assigned employees of any scheduled event assigned to them. You can add an event from the home page. Alternatively, you can add event from a record's details page. Click the record that you want to open from the list on the left side of the screen. When the record opens up, go to the Open Activities tab. Click the +Add Event button. Fill out the pop-up form. Click Save. A task is an activity that requires action on the part of the assignee. You can create different types of tasks for example, call and send samples. A task has two states: Open and Closed. You set the state of an activity using statuses. Each status has a property named Closed. When you change the status of an activity to a status in which Closed is true (checked), then that activity will be closed and the closed date will be recorded. You can add or edit a task from the home page or from within a related record. For example, the following shows the same task being edited from the home page and a customer details page. You will notice they are virtually identical except when editing from the home page you will see the Related To property whereas from the customer details page the Related To property is hidden because it is automatically set. When the record opens up, go to the Open Activities tab. Click the +Add Task button. Changing the status to a Closed status will move the Activity from the Open Activities to the Activity History Tab. Contacts will be shown only if related to sales transactions, customers and leads. Email and phone will not show when Adding an activity but will show when Editing one.